The diesel fuel/biodiesel market has recently gotten a lot more confusing. We now have another Federal agency involved in the diesel fuel marketplace. The Federal Trade Commission (FTC) has now created labeling requirements for diesel and biodiesel. These requirements have wide ranging consequences for all diesel fuel users. 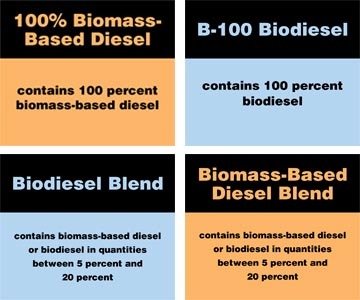 First, diesel fuel may now contain up to 5% biodiesel or biomass-based diesel with no retail labeling required as long as the blended product meets ASTM D975 (note: ASTM D975 is being changed to allow up 5% biodiesel/biomass-based diesel to be blended as part of a diesel fuel). Second, there are (according to the FTC) now two types of biodiesel, the first is the one most people are familiar with, where a plant, seed or animal derived oil is through transestrification converted to a Methyl Ester that is defined by ASTM D6751 and commonly referred to as biodiesel. The other is known as ?Biomass-based Diesel?, this a fuel derived from biomass that does not contain Methyl Esters (note: there currently is not an ASTM specification for this product). Fuel blends containing no more than five percent (5%) biodiesel or no more than five percent (5%) biomass-based diesel and that meet ASTM D975 require no label. Fuel blends containing more than five percent (5%), but no more than twenty percent (20%) biodiesel require a dispenser label 3?w x 2.5?h with a Blue background and a Bxx reporting the exact percentage or ?Between B5 and B20? statement. Fuel blends containing more than twenty percent (20%) biodiesel require a dispenser label with a Blue background and a Bxx reporting the exact percentage or ?Containing more than 20% biodiesel statement. Biodiesel that is ?neat? or B100 must be labeled as ?B100 Biodiesel? and ?Contains 100 percent Biodiesel? on a Blue background. Fuel blends containing more than five percent (5%), but no more than twenty percent (20%) biomass-based diesel require a dispenser label 3?w x 2.5?h with an Orange background and text reporting the exact percentage or ?Between 5% and 20% Biomass-based Diesel? text statement. Fuel blends containing more than twenty percent (20%) biodiesel require a dispenser label with an Orange background and text reporting the exact percentage or ?Containing more than 20% Biomass-based Diesel? statement. Biomass-based Diesel that is ?neat? or 100% must be labeled as ?100% Biomass-based Diesel? on an Orange background. Note: You should visit the FTC website at: www.ftc.gov at look at: 16 CFR Part 306 – RIN #3084-AA45 for more complete information on these requirements. What this means in the real world is that suppliers can now add up to 5% biodiesel in retail fuels without notification to customers. If you want biodiesel and have done your homework on what is required to successfully and safely use this fuel you should note what you want as you order your fuel. If you do not want any biodiesel you should issue a written purchase order to your supplier telling them exactly what you want, e.g. no biodiesel. Note: under the new ASTM D975 spec, 5% is allowed. You can get the FTC final rule in pdf format by clicking here. Enertech Labs, Inc. offers a wide range of products for diesel, biodiesel, biomass-based diesel, heating, and industrial fuels. Check out our EnerFlow? line of products for biofuels. If you would like more information or if you would like help in adapting to these new rules, please contact your Enertech Labs representative.